Section view of a manual operated 2-way ball valve. 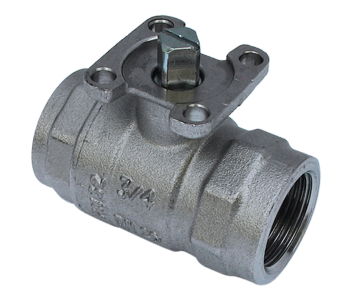 A ball valve is a shut-off valve that controls the flow of a liquid or gas by means of a rotary ball having a bore. By rotating the ball a quarter turn (90 degrees) around its axis, the medium can flow through or is blocked. They are characterized by a long service life and provide a reliable sealing over the life span, even when the valve is not in use for a long time. As a result, they are more popular as a shut-off valve then for example the gate valve. Moreover, they are more resistant against contaminated media than most other types of valves. In special versions, ball valves are also used as a control valve. This application is less common due to the relatively limited accuracy of controlling the flow rate in comparison with other types of control valves. However, the ball valve also offers some advantages here. For example, the valve still ensures a reliable sealing, even in the case of dirty media. The valve may have two, three or even four ports (2-way, 3-way or 4-way). 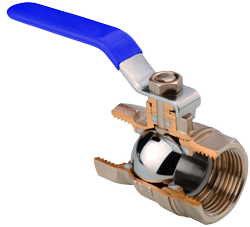 The vast majority of ball valves are 2-way and manually operated with a lever. The lever is in line with pipe when the valve is opened. In closed position, the handle is perpendicular to the pipe. Manually operated ball valves can be quickly closed and therefore there is a risk of water hammer with fast-flowing media. Some ball valves are fitted with a transmission. The 3-way valves have an L-shaped or T-shaped bore. As a result, various circuit functions can be achieved such as distributing or mixing flows. In the image below, the circuit functions 3-way ball valves are shown schematically. Example of a 3-way ball valve. The circuit functions for a T-bore and L-bore are given. The assembly of the valve housing can be divided in three commonly used designs: one-piece, two-piece and three-piece housings. The difference is how the valve is assembled and this affects the possibilities for maintenance or repair. The operation of thevalves is the same in each embodiment. One-piece - This is the cheapest variant. The two parts which enclose the ball are pressed or welded. The valves can not be opened for cleaning or maintenance. This type is generally used for low-demanding applications. Two-piece - Two-piece valves can be disassembled for cleaning, servicing and inspection. Often, the parts are connected via a threaded connection. The valve must be completely removed from the pipe in order to separate the two parts. Three-piece - More expensive valves have often three pieces. The parts are generally clamped together by bolt connections. The advantage of this embodiment is that the valve can be serviced without removing the entire valve from the pipeline. The most common design is the "floating ball design". The ball is suspended in the media and held in place by two sealing rings. Some high-quality valves have a "trunnion ball design". The ball is supported at the top and bottom to reduce the load on the valve seats. Floating - The majority of ball valves have a floating ball. The ball is supported by the valve seats. 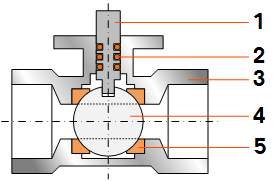 Trunnion - Valves with large diameters and high operating pressures (for example DN >100mm and 30 bar) have often a trunnion design. The ball is supported on the bottom and top to reduce the load on the seat rings. The operating torque is generally lower for trunnion valves. The hole through the ball may have different profiles such as a full bore, reduced bore or V-shaped. Reduced bore - Most ball valves have a reduced bore. 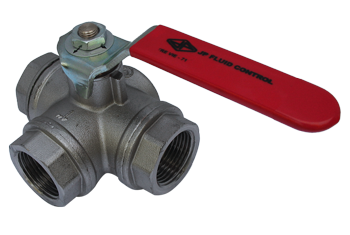 As a result, the ball valve introduces friction losses in the system. These losses are still relatively small compared to other types of valves. One-piece ball valves are almost always reduced bore. Full bore - Full bore valves have the same bore diameter as the pipe. The advantage is that there are no extra friction losses, and that the system is mechanically easier to clean (pigging). The downside is that the ball and the housing are bigger than a standard ball valve with reduced bore. The cost is therefore slightly higher, and for many applications this is not required. V-shaped - The hole in the ball or the valve seat has a "V" shaped profile. As a result, the desired flow rate can be controlled more precisely by rotating the ball. By optimizing the profile, a linear flow characteristic can be approached. The most common housing materials for ball valves are brass, stainless steel and PVC. The ball is usually made of chrome plated steel, chrome plated brass, stainless steel or PVC. The seats are often made of Teflon, but could also be made of other synthetic materials or metals. More information on this topic you can find on the page: Chemical resistance of materials. Brass ball valves have the largest market share. Brass is an alloy of copper and zinc and has good mechanical properties. Brass valves are used for (drinking) water, gas, oil, air and many other media. Chloride solutions (e.g. seawater) or demineralized water may cause dezincification. Dezincification is a form of corrosion where which zinc is removed from the alloy. This creates a porous structure with a greatly decreased mechanical strength. 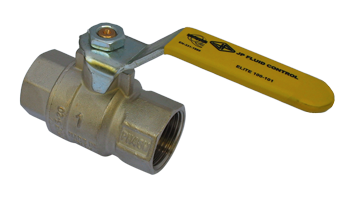 Example of a brass ball valve with approval for use in gas appliances. Stainless steel ball valves are used for corrosive media and aggressive environments. They are therefore often used in seawater, swimming pools, osmosis installations, with high temperatures, and many chemicals. Most stainless steel is austenitic. Type 304 and 316 are the most common, 316 has the best corrosion resistance. 304 is sometimes referred to as 18/8 because of 18% chromium and 8% nickel. 316 has 18% chromium and 10% nickel (18/10). Stainless steel valves usually require a higher operating torque than for example brass or PVC valves. This must be taken into account when a stainless steel valve is operated by an electric or pneumatic actuator. Example of a 3-piece stainless steel ball valve. 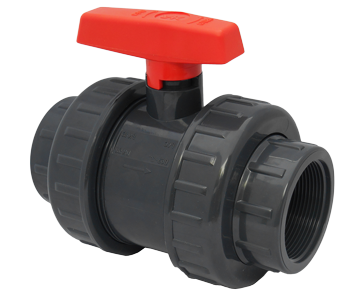 PVC ball valves often have a lower price (except for ISO-top valves) and are widely used in irrigation, water supply and drainage or corrosive media. PVC stands for polyvinyl chloride. PVC is resistant to the most of the salt solutions, acids, bases, and organic solvents. PVC not suitable for temperatures higher than 60 °C, and is also not resistant to aromatic and chlorinated hydrocarbons. PVC is not as strong as brass or stainless steel, therefore PVC ball valves have lower pressure rating. A more in-depth article about PVC ball valves can be read here. Example of a PVC ball valve with double union design. Most valve seats are made of PTFE (Teflon). PTFE stands for PolyTetraFluorEthylene. This material has a very goed chemical resistance and a high melting point (~327°C). Besides that, the friction coefficient is extremely low. A small disadvantage of PTFE is that the material shows creep, which can cause a deterioration of the sealing over time. Besides that, PTFE has a rather high thermal expansion coefficient. A solution for this problem is to use a spring in order to apply a constant pressure on the Teflon seal, like for example a cup spring. Other popular sealing materials are enforced PTFE and Polyamide (Nylon). The harder the material of the valve seat is, the more difficult it is to maintain proper sealing. For some application in which soft materials are not possible to use, for example with very high temperatures, metal or ceramic valve seats are used. For certain applications, approvals are desired or required. Drinking water and gas are the most common. Choosing a certified ball valve, assures that the product meets important safety requirements. 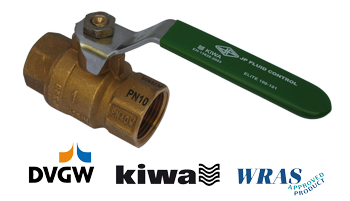 These ball valves are suitable for drinking water applications and have a WRAS, KIWA or DVGW approval. Ball valve with WRAS approval. 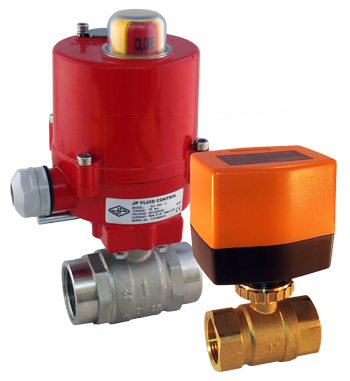 These valves are approved for application in gas appliances. 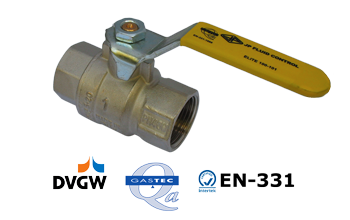 Certified ball valve for gas applications. Examples of electric operated ball valves. Ball valves can be driven manually, electrically or pneumatically. Electric ball valves use an electric motor to rotate the ball. The electric actuator often consists of a protective housing with an internal electric motor and a reducing gear mechanism. This reduces the speed of opening and closing and reduces the risk of water hammer. Furthermore, the operating torque is increased. Usually, the actuator can be disconnected from the valve. The most common flange connection between the valve and actuator is the ISO 5211 standard. The photo below shows an example of a ball valve with ISO 5211 flange, often called ISO top. Example of a ball valve with ISO-top. 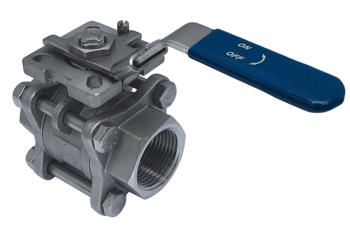 Most electric ball valves use the electric motor for both opening and closing. Spring closed or battery closed actuators are less common, and close (or open) automatically once the power supply is shut down. More luxury versions often have a visual position indicator and the option of manual control.